In my last post, I asked you to spend a few minutes capturing what were Peak Moments from your past. This exercise gets to the heart of when you were at the top of your game. Each week in this series builds on the next, so a theme starts to emerge. The very tangible result is you leading and moving toward something meaningful. Leading not according to becoming something — such as, the latest leadership model — but rather, becoming you. The last thing this world needs is a bunch of people acting the same. Today’s discovery features the sometimes unpredictable concept of inspiration. However, if we consciously understand by what or whom we are inspired, we can generate inspiration for ourselves, when we need to. View it similar to developing muscle strength or when something initially requires discipline, but then becomes a habit. First, let’s tap into that feeling of being inspired. It looks like this: you are completely energized, excited, motivated, ambitious and optimistic about something. When did you last feel like the above? What were the circumstances? For example, you were starting something new, someone took a chance on you, you witnessed amazing courage or action, you had a great idea or “aha” moment, or strived for something special. 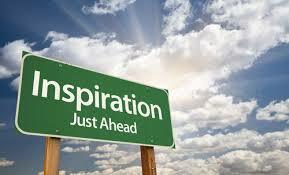 Think of a person that inspires you. List the person’s attributes that makes you feel as such. You should notice themes emerging. Be careful not to succumb to hopeless talk, i.e. something that initially inspired you has over time, been drowned by monotony or unforeseen challenges. Possibilities only disappear in our own minds. Please post comments about surprises, thoughts and insights you gain throughout this process to help others on their journeys! Good reminder to remember what inspires us…I needed that today. Kelly, I think it’s why I write about it frequently — I, too, need to remind myself! People and certain things may passively inspire us, but it’s up to us to remain so!